Just when you think you’ve reached the end of the road, you find that that Dead End sign you’ve seen is just a mirage. You actually have more road to go. Not just that, but there’s a fork in it to, taking you to a new, completely unexpected destination. We had just started to really focus on wrapping our minds on the realization that children were probably never going to be a part of our future. Luckily for us, we have always been career driven, so it was easy to keep our focuses on that. Until that positive test came. Then the 10 more I took just to be sure. Because, well, after all of the bad news, tests, more bad news and so on and so forth… That test couldn’t really being saying “Pregnant +3 weeks”. Could it? Welp, those positives were definitely positives and it was confirmed 100% with a sonogram at eight weeks. There’s a little baby Rebel inside, growing happy and healthy. So naturally I stopped all workouts, kayaking, walks, etc. Right? Wrong. And to be rude, anyone who tries to tell me that, I’m going to laugh at. My doctor not only approved of me sticking with my workouts, my summer kayaking adventures, walking with my dog, etc… but he strongly encouraged it. It has been my lifestyle for more than a decade. My focus for the pregnancy is to maintain. Obviously that 260-pound deadlift I was doing back in late May isn’t something I’m going to be attempting again until this time next year. Same with those 150-pound squats I was doing. I have been dealing with rolling waves of never ending morning sickness, and much to my husband’s disappointment – it’s not slowing me down. I feel my best when I’m moving. When I’m walking Dunkin. When I’m in the gym. When I’m tending to my gardens. If it makes me feel good, obviously, I’m going to do it. The first week in the gym was certainly a learning curve. I didn’t want to push myself, but I wanted to get a solid workout in. I’d grab for too-light weights, get frustrated and jump up in pounds only to realize before I even got back to my bench that I was being ridiculous and the ones I grabbed were too heavy for what I was intending to accomplish. Once I got the weights, the reps and the sets down pat, it was rearranging my workouts so that by the start of my second trimester I wouldn’t be on my belly or on my back. That was actually the easiest part. I do monitor my heart rate, like I always have done. Not because of the old, now disproven 140-beats-per-minute thing once told to all pregnant woman, but because I want to know my accurate calorie burn. At the end of the day, I want to make sure I’m adding in what I’m burning off with exercise. It’s going to be a constant learning adventure for me. 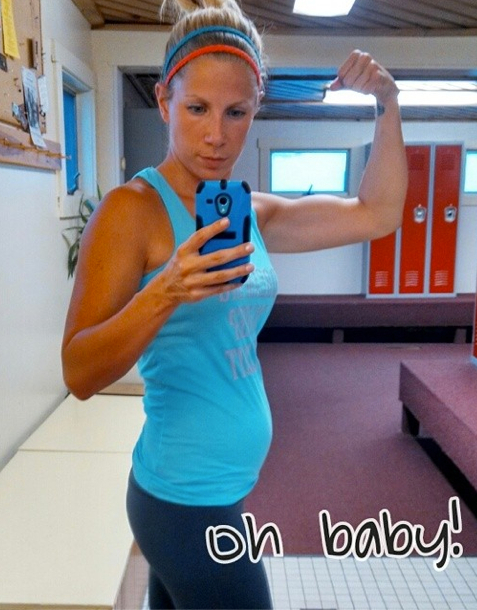 I’m lucky in that my two favorite fitness pros are pregnant right now as well. I’ve been following Ashley Horner and Jessie Hilgenberg during their fit pregnancies, and it’s good to see what I’m doing mirrored in what they’re doing as well.